The mango season is not technically over. In the monsoons, one gets to savour different varieties like the langda, chausa and kesar. I particularly love the kesar variety. During the peak of the mango season Im partial to the alphonso mango. I also buy the payri to make amras (mango juice eaten with puris or as it is) with a 50:50 ratio of alphono and payri. Another variety which I love is the malgova which I rarely get to buy in Mumbai. If Im fortunate enough to go down south, then I relish malgova with all my heart. Although I made this cake with the alphonso mango, you can try it with any other variety. I wanted to share this cake with you before the mangoes completely disappear from the market. This cake was made on a special occasion for my husbands birthday. Every year I like to make a special cake for him, something that I havent made before and you can find all those cake recipes on this site. It is no secret here that I love to make cakes. And I really enjoyed making this cake. I used my good old chocolate sponge recipe and layered it with mango jam, chocolate buttercream and fresh cream. This turned out to be a stupendous combination! Chocolate and mango pairs very well and for those of you who dont use chocolate, you could replace the cocoa with carob powder. Good carob powder is still difficult to come by here in India, so I end up using cocoa powder. 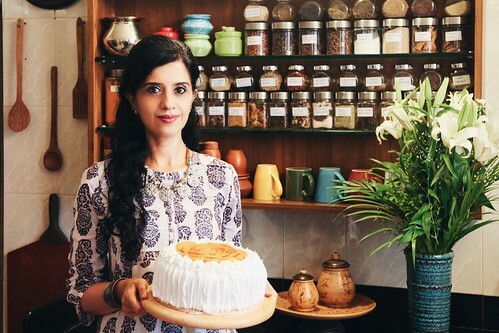 Im saying goodbye to the mangoes this season with this gorgeous cake. Although it looks like a task to make this, trust me when I say this that the mango rose is quite easy to make. If you scroll down to the recipe, I have put in a link to a video for making the mango rose. 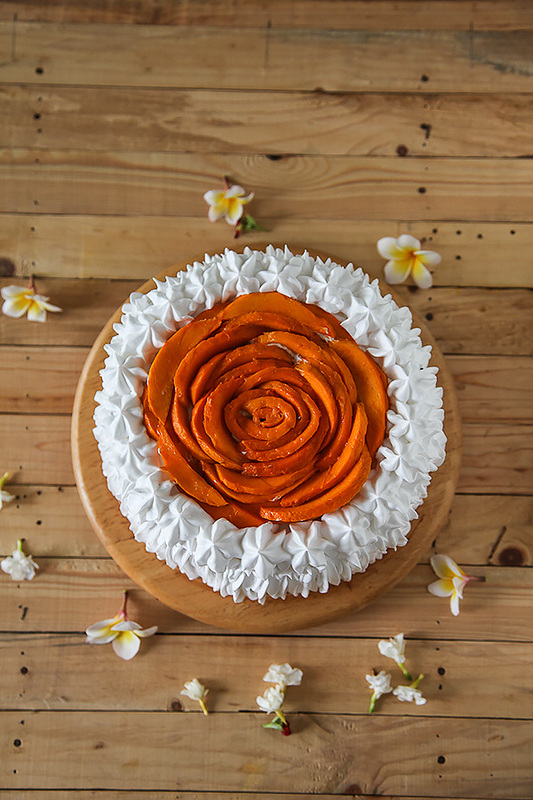 If you cannot make this cake this season, make sure you bookmark this recipe to welcome the mango season next year with this lovely cake. And if you are still bent upon making this cake and dont have mangoes, replace it with any seasonal fruits and jams and enjoy! 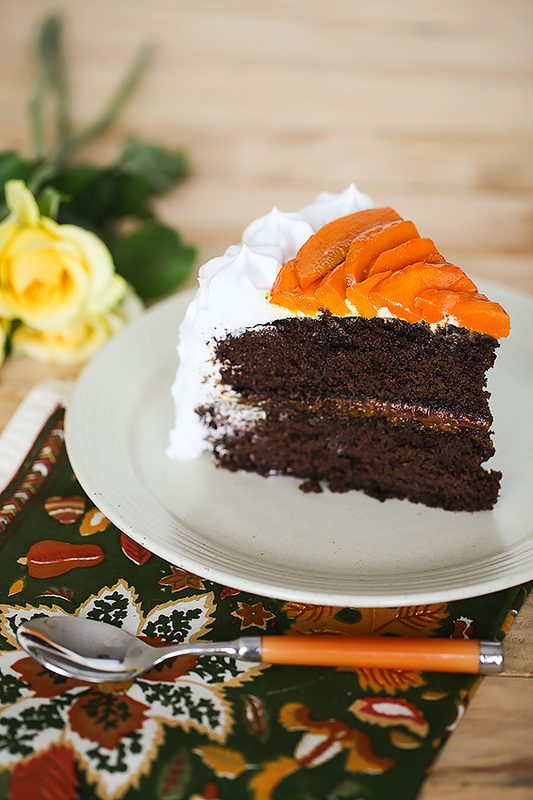 A luscious cake sandwiched with mango jam, chocolate buttercream and fresh cream and topped with fresh mangoes. Grease and line the base of two identical 8 round cake tins with greaseproof paper/baking parchment/butter paper. In a mixing bowl, assemble the flour, cocoa powder, sugar, baking powder and baking soda, mix with a spoon and sieve once to make the mixture uniform. Add in the condensed milk, melted butter, vanilla and water. Beat with an electric hand mixer, whisk or spoon just until the mixture is uniform and smooth and there are no lumps. This shouldnt take more than a minute with an electric hand mixer/beater. Be careful not to over beat as this tends to stiffen the batter which might lead to a less softer cake. Pour the batter into the prepared cake tins and bake for 25 to 30 or until a skewer or toothpick comes out clean. After the cakes are done, allow them to rest in their tins for 3 to 4 minutes and then invert them on to a cooling rack. When the cakes are cooling, make the sugar syrup, chocolate buttercream and whip the cream. In a small saucepan, heat the sugar with the water over a medium flame until the sugar dissolves and begins to boil. Turn off the heat and allow to cool. For the butter cream, mix the butter, sugar, cocoa powder and the extracts in a bowl and mix with a whisk. Slowly add the milk and whisk until smooth and well blended. In a chilled bowl add the whipping cream and beat with a hand blender or in a stand mixer, until you get soft peaks. Layer the middle of the cake with this softly whipped cream. Beat the remaining cream until you get stiff peaks to cover and decorate the cake. Place one half of the cake over a serving plate. Put some sugar syrup all over it. Spread the mango jam, leaving 1/4 space at the borders. Put the chocolate buttercream over the jam. Carefully place the other cake over the buttercream and moisten it with the sugar syrup. With the help of a palette knife level both the cakes, by pressing the knife over the sides, rotating the cake at the same time. Whip the remaining cream until stiff peaks form. Spread the whipped cream on top of the cake and cover it over the sides as well. With the help of a cone and an icing nozzle pipe stars or rosettes on the edges of the cake. Decoratively arrange the mango slices on top of the cake. Chill for 2 to 3 hours before serving. To make the mango jam, pure 1 cup of mango slices in a blender. Place the pureed mango in a heavy bottomed pan and add 3 to 4 tbsp of raw sugar. Cook until the sugar melts and the puree thickens. To make the whipped cream, chill the bowl and the beater in the refrigerator. This helps to get the stiff peaks. I used a sweetened whipping soy cream, available in the market. If you are using unsweetened dairy cream, add 2 tbsp icing or confectioners sugar and tsp vanilla extract to 1 cup whipping or heavy cream before you start to beat the cream. I used Wilton 2D nozzle to pipe the stars here. Learn how to make a mango rose here. 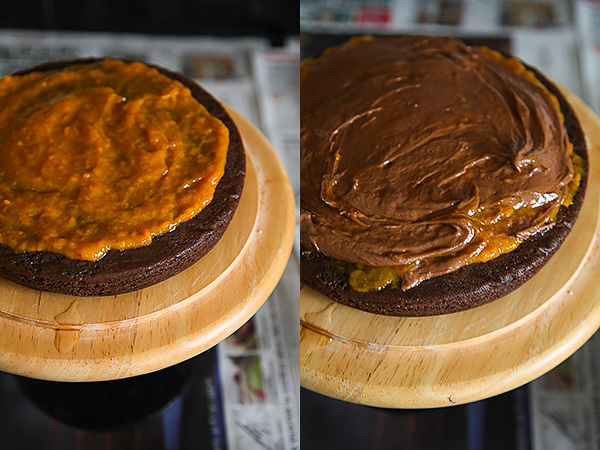 The cake looks delicious….just a quick question….since we need to use 2 cake tins and divide the batter in 2 batches, do we let the 2nd batch sit in the tin while te first bakes? As most of us would have a small oven to accommodate only 1 tin at a time and not big eneough for a large tin….or do we make the batter twice? Please guide. This couldn't have gotten any more delectable. What a beautiful blend of flavors, Mango and chocolate, i would never have come up with it. 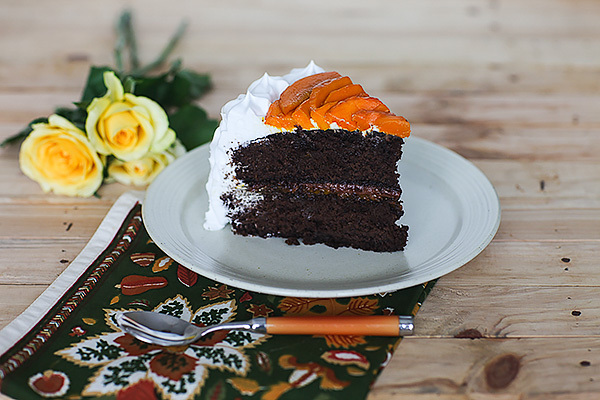 After relishing raw mangoes and aamras-puri combo, you have provided me with another version of mangoes in the form of eggless chocolate mango rose cake. It really looks pleasant. & cream combination. Am sure every bite is a sumptuous mouthful! Can't wait for the summer to make & devour this cake. Thank you Linda! I'm sure you will love this! Yes, jinny you can allow it to rest in the tin while the other cake bakes. Thanku dear for sharing this yummy recipe for the cake. will definitely make this mouthwatering mango cake.